This is the first Perennial paperback edition published in 2001 by HarperCollinsPublishers. The cover design is by Kristin Anderson with cover photo by Jake Rajs/Tony Stone Images. The front cover features a photograph of a bison standing in tall yellow grass, with blue sky and cumulus clouds in the background. The title is printed on a stylized inset resembling crumpled paper or old newsprint. Praise from the Los Angeles Times is across the top, and the author's name and "New York Times-Bestselling Author of Hunting Badger" appear across the bottom of the front cover. 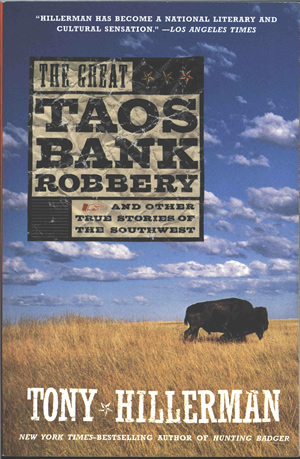 The back cover displays an opacified version of the photo from the front cover, without the bison, praise from the (Santa Fe) New Mexican, a two-paragraph synopsis, praise for Tony Hillerman, the publisher's imprint, price, and barcode sticker. The inside front and inside back covers are blank. Binding: Full-color paper covers with title, author, and logo printed in black on a white rectangle, on a red background, on the spine.